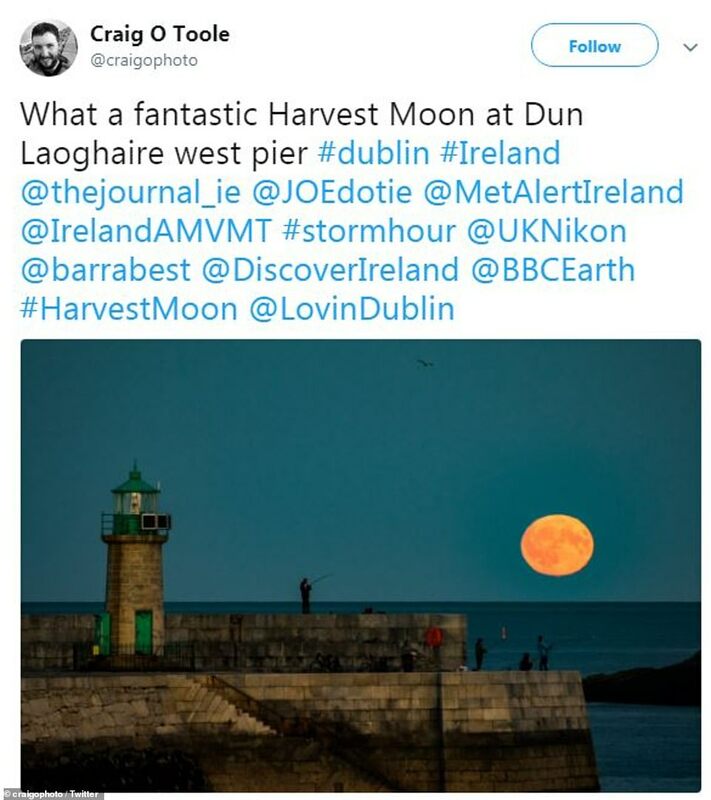 Skywatchers stared to the heavens in awe last night as the Harvest Moon made its annual appearance in the skies over Europe. 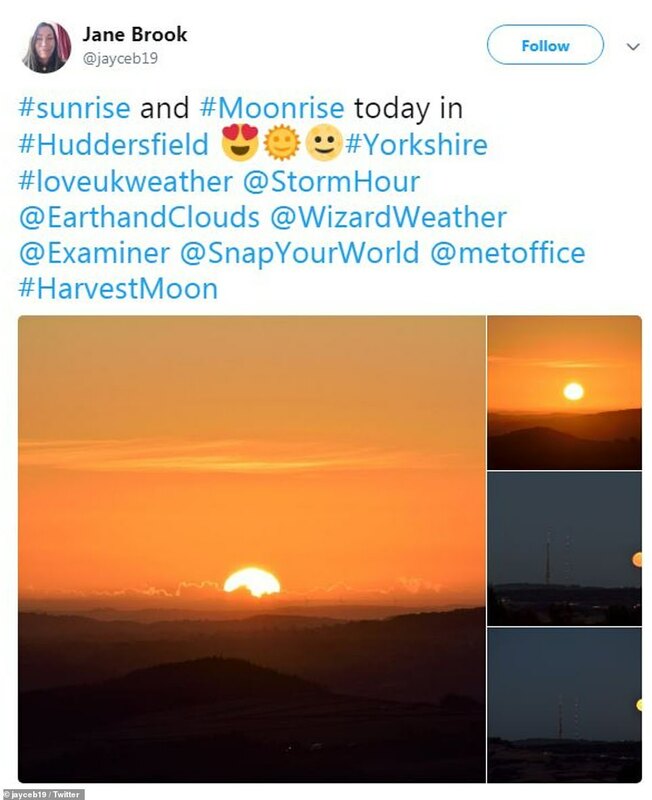 Incredible photographs from Hampshire, Cornwall and London show the Earth's celestial little brother dominating the night with a glow ranging from vivid orange at sunset to a milky white later on. The Harvest Moon is the name for the closest full moon after the Autumnal Equinox, which we had on Sunday. It usually appears in September and was traditionally a symbol that told farmers when to harvest their crops. 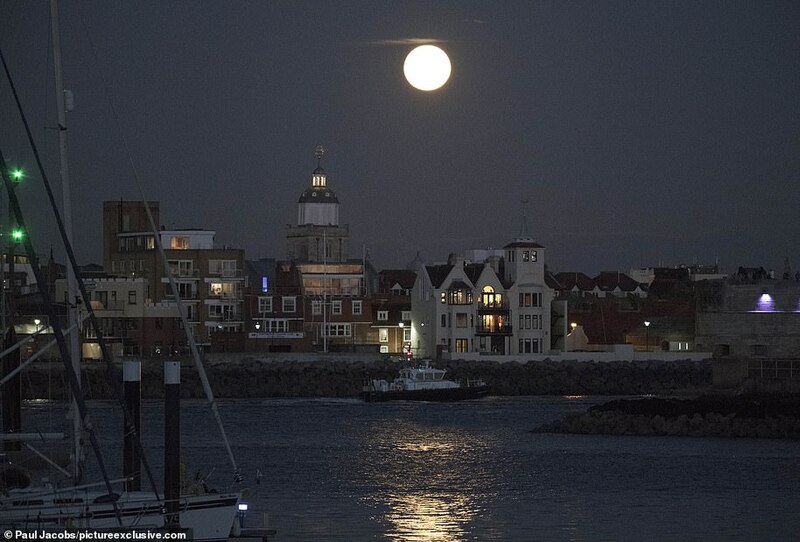 In Portsmouth, Hampshire, moonlight shimmered on the calm waters of the harbour, while a seventeenth-century ship weather vane on the cathedral was thrown into silhouette. 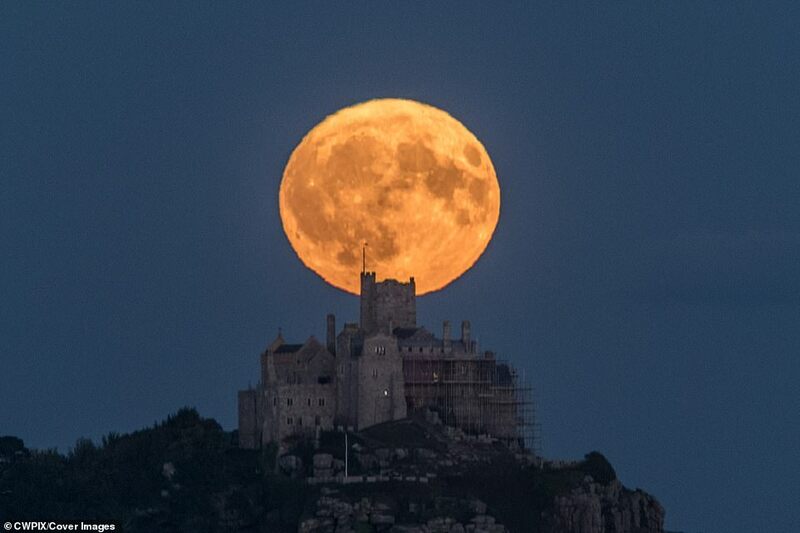 A similarly spectacular view was captured at St Michael's Mount, Cornwall, where the moon hung like a giant orange orb over the battlements of the 12th-century castle. 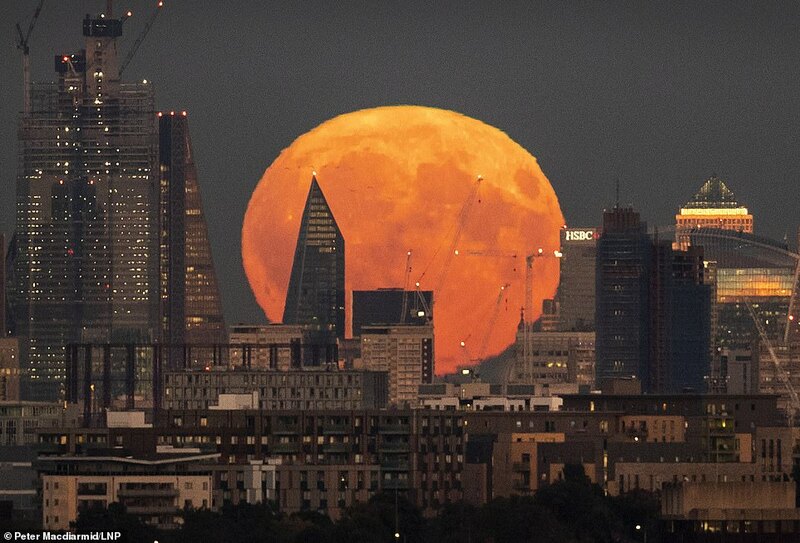 London saw the moon rise at 7.08pm, giving an other-worldly backdrop to the mass of glass towers that make up the financial districts in the City and Canary Wharf. Why does a Harvest Moon look so much bigger? While the Harvest Moon may appear to be particularly big, the moon itself isn’t changing size – just our perception of it. It’s the location of the moon near the horizon that causes the Harvest Moon to look big. When the moon is on the horizon, we see it alongside other reference points at the same time. Our brains are wired to recognise relative scale, so when we see the moon alongside other objects, such as buildings or mountains, we think it is large. But when we see the moon high in the sky, there is no other information to compare it to, so our brains see the moon as smaller. When does this astronomical spectacle take place each year? The moon has been used by civilisations all over the world to keep track of time and, according to lunar tradition, each month's full moon receives its own name. The names will vary by location and differing folklore, however many are based on the moon's seasonal characteristics. The Harvest Moon is the closest full moon to the fall equinox in the Northern Hemisphere, and usually takes place around September 22. Although it has been some time since we last saw an October Harvest Moon, it is not that rare an anomaly. 'The previous one was in 2009, but the one before that was 2006, and the next one will be in 2020, Earnie Wright, a specialist at the NASA Goddard Space Flighty Center's Scientific Visualization Studio in Maryland told National Geographic. 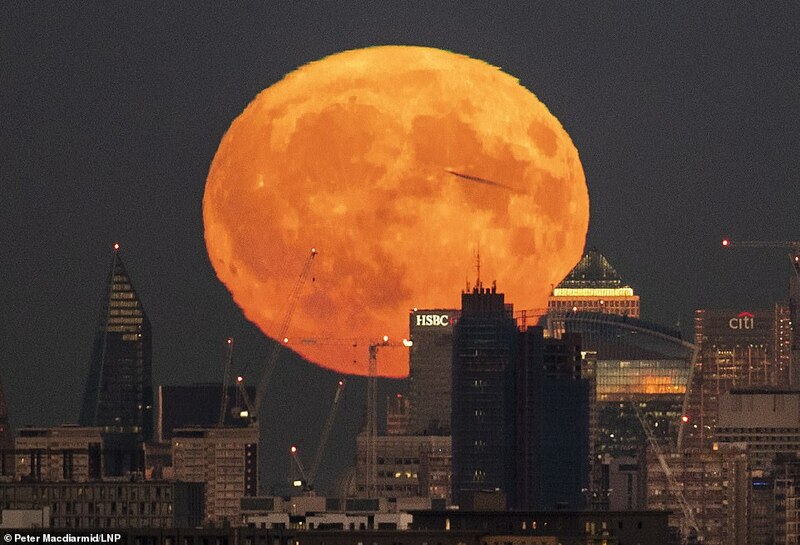 Based on the equinox's timing and the regular 29.5-day cycle of the moon, a harvest moon can happen on any date between September 8 (as in 2014) and October 7 (as in 1987). It usually appears in September and was traditionally a symbol that told farmers when to harvest their crops. 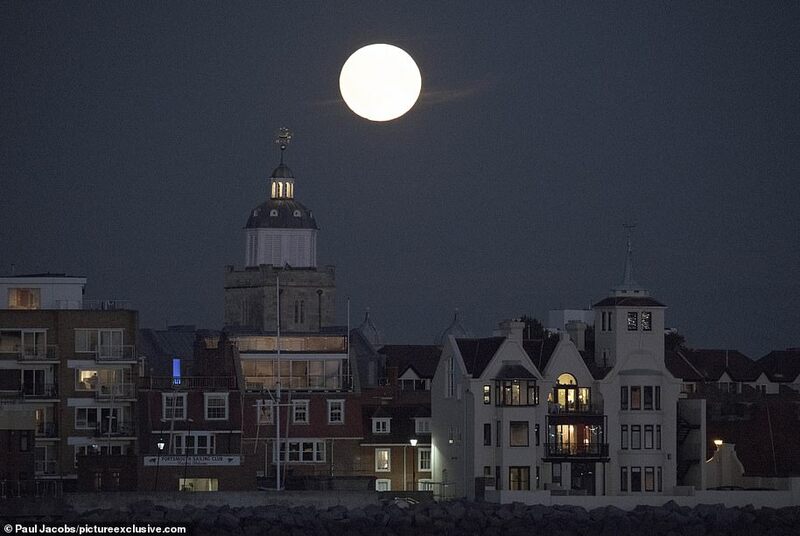 It is seen rising over Portsmouth Cathedral It means the likelihood of an October harvest moon is roughly one in four, according to Mr Wright. 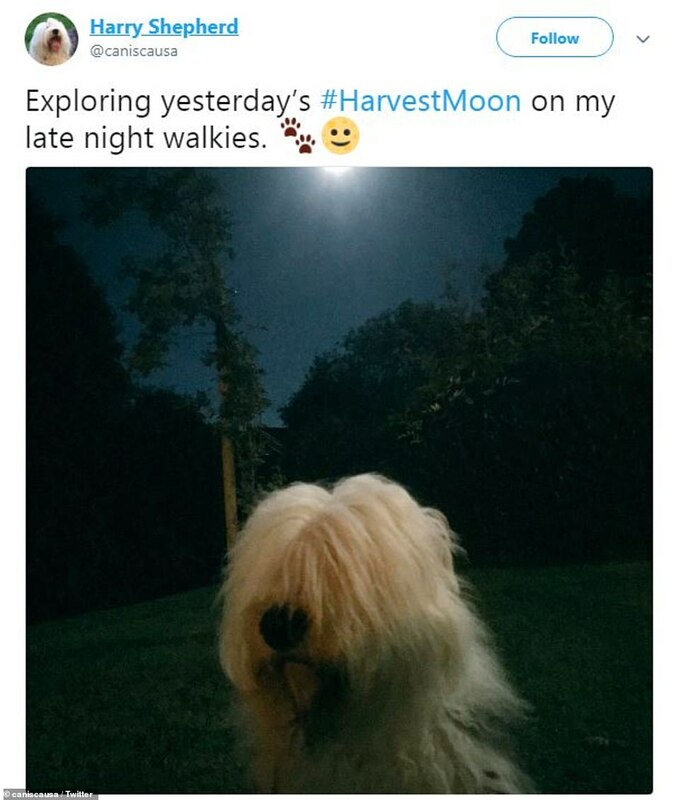 Why is it called a Harvest Moon? Throughout the year, the moon appears over the horizon about 50 minutes later each days, on average. But for several days around the fall equinox, the moon rises only about 30 minutes later in the US, an just 10 to 20 minutes later throughout Canada and Europe. While it might sound like not much of a difference, but the shift brings noticeably bright nights. The full moon will rise almost immediately after the sun has set, first appearing as a huge, orange-coloured orb around dusk. And with shorter periods between sunset and moonrise, farmers are able to work harvesting the crops later on into the night, hence this particular moon's name. The harvest moon is a full moon, but not one that really provides any specific unique-viewing opportunity—other than that you might have great observing from a pumpkin patch,' Andrea Jones, the Lunar Reconnaissance Orbiter public engagement lead at NASA said. DO FULL MOONS ACTUALLY DRIVE PEOPLE MAD? An investigation by the Wall Street Journal found that, in hospitals across the U.S., medical staff are convinced that full moons are ‘harbingers of chaos in their emergency rooms and delivery wards’. 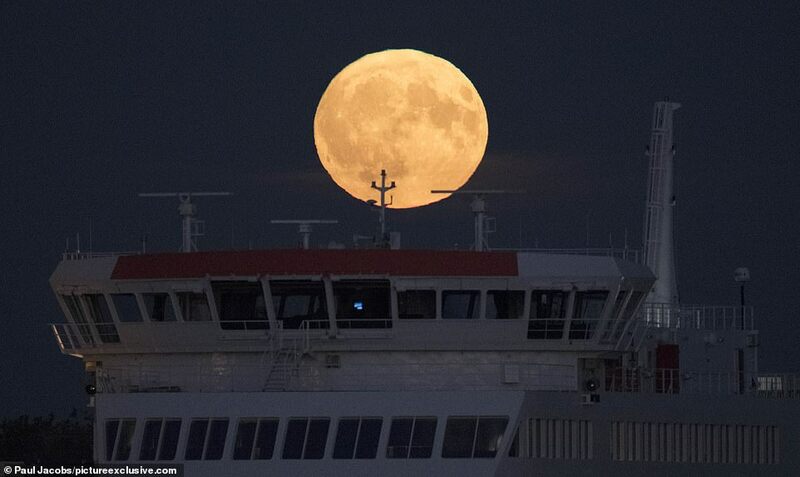 Doctors and nurses said full moon nights prompted a surge in patient admissions, particularly involving psychotic episodes, as well as strange injuries and women going into labour under unusual circumstances. A hospital nurse in San Antonio, Texas, recalled a full moon night when so many high school students were rushed in — all suffering from food poisoning — that the hospital ran out of beds to put them in. Some hospitals put more staff on at full moon and ban doctors from taking days off. John Becher, an A&E doctor in New Jersey and Philadelphia for 40 years, became so convinced by the phenomenon that he didn’t want to work on full moon nights. Many medical staff had their own theories for why the full moon affects us. Michelle Schusky, a veteran radiologist, put it down to the composition of the human body. ‘Our bodies are 70 per cent water and, because the moon moves the oceans, it moves the water in your body — people flip out,’ she said. Skeptics have suggested they are victims of so-called ‘confirmation bias’ — they notice it happens to be a full moon on a night when odd things happen, but ignore the full moon nights that are deadly dull. For all that, the Sun’s effect on humans and animals is enormous, giving us the 24-hour circadian rhythm, a cycle that dominates so many creatures’ existence — everything from appetite and mood to sleep quality. That is well accepted in conventional science. Is it really so irrational to assume that the Moon influences us, too?